I had a bit of spare time today, so I was able to indulge in once of my favourite pasttimes: drawing fake covers for nonexistent romance comics! 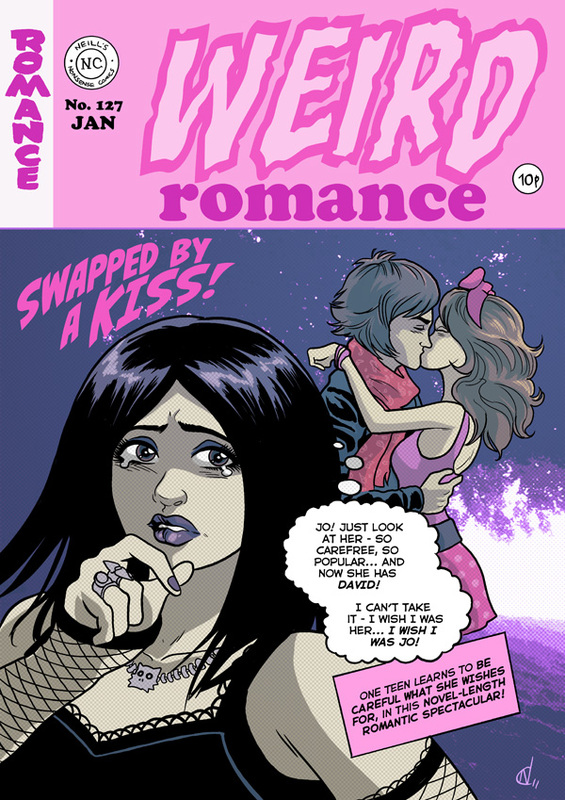 In this case it's for a nonexistent comics adaptation of Luisa Plaja's teen bodyswap romantic comedy novel, Swapped By a Kiss. I read Swapped... after meeting Luisa at the Random House Children's Books Christmas party (which I blogged about here), and thinking that a teen bodyswap romantic comedy sounded right up my alley. And so indeed it proved! Funny, charming, heartfelt, and with a throrough appreciation of both the 80's bodyswap genre of cinema (for my money, the BEST genre of cinema) and of comics culture running through it, it's an extremely enjoyable book, and one I would entirely recommend. And yes, I know I'm not a 12-year-old girl. What, a grown man can't enjoy teen bodyswap romantic comedies now? What kind of a society are we living in, anyway? EDIT: Here's the sketch, pencils and inks, in case anyone's feeling process-nerdy today! Anyway, drawing this has pretty much confirmed for me that I basically want to draw a bunch of romance comics, right away. More soon!